Winners On Wheels! WOW empowers kids in wheelchairs by encouraging persona achievement through creative learning and expanded life experiences! Welcome to the official site of Winners On Wheels! WOW empowers kids in wheelchairs by encouraging personal achievement through creative learning and expanded life experiences that lead to independent living skills. Winners On Wheels is proud to provide you with a site that you can call home on the Internet. There are tons of cool things on this site for you to enjoy. 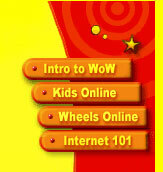 Feel free to send WOW an e-mail anytime letting us know how you like the site. Our e-mail address is: info@wowusa.com Don't forget to visit the Internet 101 Section and the Wheels Online Section....they are awesome. Winners On Wheels wants to provide the Parents and Volunteers with the best amount of information possible Online. Therefore, we are working hard to post all necessary forms, publications, contact information, etc...online so you can have access to it anytime and anywhere. The following sections of the website have been created with you in mind: Parent Section, Volunteer Section, Publication Section, and Corporate Section. Please feel free to contact WOW via e-mail @ info@wowusa.com or phone @ 1-800-WOWTALK.